Masculine and tough. Good fitting in new durable material. A casual style that meets a modern universe. These key phrases are characteristic of the trousers in MASCOT’s line MASCOT® ROCKS, which are made from the unique material Tencel®. Captions:Keep up with fashion and hop into a pair of trousers from MASCOT® ROCKS! The MASCOT® Arkansas trousers are available in black, navy and olive. Top MASCOT® Anzin from the MASCOT® CROSSOVER range. Tencel® is a fiber extracted from eucalyptus trees and is commonly best known within the sports world. Tencel® is often used in professional sports clothing because the material is both good for absorbing sweat and moisture and also for cooling the skin. Although you may not be a top athlete your job is probably, at times, also physically demanding. Like a sportsman you may have experienced that it can be difficult to get moisture away from your body when you are physically active while working. Therefore Tencel® is a good material to use in work clothing and it is one of the reasons why MASCOT has chosen it for the new work wear trousers. Tencel® is also considerably durable, soft and comfortable fabric to wear. This means that you can work a full day at work in trousers that are just as comfy as your home casual wear. 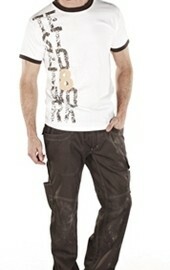 The trousers have a good fit and trendy visual effects, such as reflectors at the back of the trousers. You can combine the trousers with a gilet or shirt from MASCOT® ROCKS or even one of the new shirts from MASCOT® CROSSOVER, to create a great look for spring. As an extra advantage Tencel® is biodegradable and the eucalyptus trees, which are used in Tencel®, grow on farms that are sustainable.